Our Automatic Tablet Counters can be more than enough for you when you are looking for the highest quality performance at the most affordable price. Model ALP-24 is a 24 Channel Tablet counter which is great for counting pharmaceutical products such as capsules, tablets, pills and such materials. The counter is available in both 16 & 24 channel options and each machine has 2 nozzles designed for successful operation in coordination with any application. This series of counters exhibit a vibration plate which operates in three phases and is very suitable to infeed tablets/capsules. Fast, stable infeeding is ensured by the adjustment of the frequency of vibration. Before the filling operation begins, the bottles are placed at fixed positions below the cylinder, which authenticates precise placement for filling. The detection of counting units is operated using dynamic photoelectric sensors. This leads to extremely accurate counting numbers. The gate is controlled by computer and is very responsive and unique. The control of the machine and further maintenance is not a problem at all considering that it has PLC interface installed in the machine. The products are released using vibration and dedusting system which are completed in to consecutive steps without causing any physical damage to the capsule or the products and of course, the entire process is completed conforming to cGMP standard. 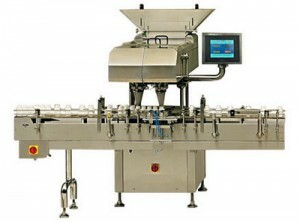 The channels in each machine are provided with USA made product sensors which help to count the products that fall freely and the dust compensator ensures the accuracy of counting and thereby performing the function of this machine flawlessly.